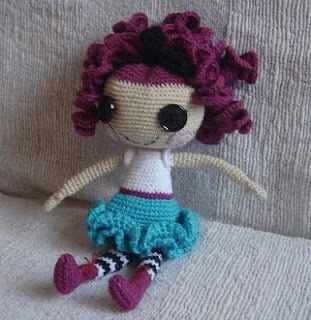 I saw this really awesome crochet pattern for a little Lalaloopsy like doll while I was browsing Flickr and I wanted to share it with everyone. Sometimes things like this have a habit of disappearing and I wanted to make sure it was not lost. 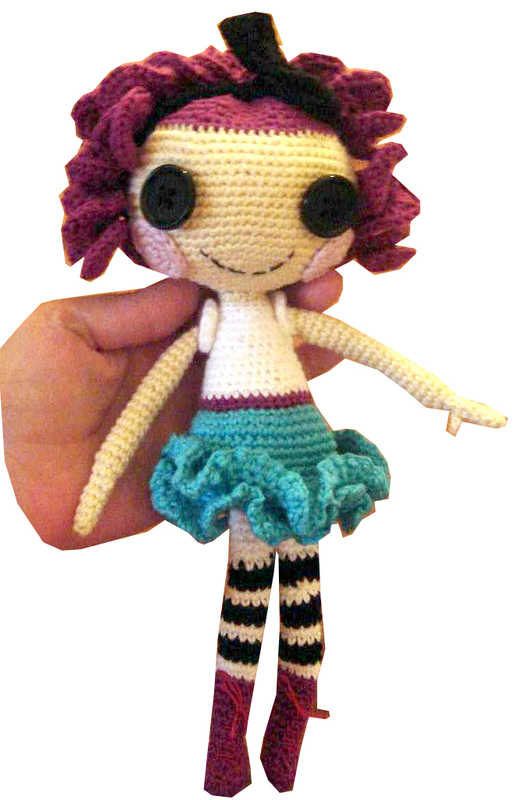 The original tutorial can be found here. Rnd 3 : (1sc, inc) around. Stuff body and insert q-tip or something like pipe cleaner in the neck. This is where I sew cheeks on and embroidery the mouth. Work in front loops of 12th round of body with head facing toward you. Join with sl st , ch 1, sc in same stitch. Rnd 12: inc around. Fasten off. Join with sl st , ch 1, sc in same stitch. Rnd 6: (chain 3, sc in next stitch) around. Rnd 3: 3sc, (thumb) chain 3, slip stitch in second chain from hook, slip stitch in next stitch, work sc in remaining 3 stitches. Rnd 24: 2sc, in next stitch work sc, hdc, hdc, (4 dc in next stitch) two times, in next stitch work hdc, hdc, sc, and finally work 2 sc. Fasten off. Leave a long tail to sew arms to body. I have worked chains from 15 to 40 stitches and than worked 3 hdc or 3 dc in one chain. Than I insert hook where I wanted the curl, pull the tail through and tie a square knot with both ends. Insert ends in the head. Chain about 20 stitches. It supposed to be long as the pink part of the head is from side to side. Work 5 rows. Chain 24. Slip stitch to first chain and work 4 rounds. Do not fasten off. Bring the seam of bow on the back, in the middle, than chain 6 and slip stitch it in the first chain. Sew the bow onto the band. Than sew the band onto the head to cover the beginning of the hair.